Nepal is a landlocked nation located in the Himalayas, sandwiched in between the People’s Republic of China and India. The country had been ruled by a monarchy since 1768 until a decade long Civil War with the Communist Party of Nepal resulted in the first democratic elections in 2008. The music of Nepal reflects its culture and its many different ethnicities. Due to its geographic location, you can hear influences from India and China with 81% of the population is Hindu and 10% is Buddhist. But since the majority of the county is rural with only one major urban center – Kathmandu – the predominate music tends to be more classical and folk. Although I have read mention of rock music influencing the music of Nepal as early as the late 70s, I have yet to find any recordings pre-dating the early 90s. 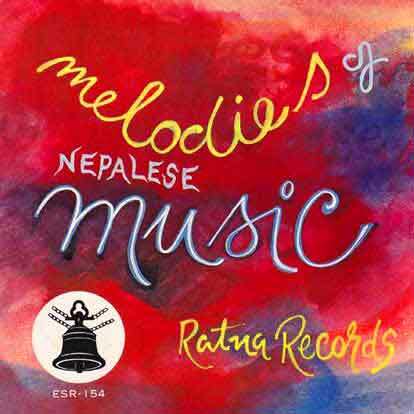 According to Discogs.com, the Shree Ratna Recording Corporation apparently released a number of these “Nepalese Songs & Melodies” / “Folk Tunes of Nepal” / “Nepalese Folk Tunes” seven inch e.p.s in the late 70s and into early 80s. Both Madan Pariyar and Ram Sharan Nepali were featured on some of the releases other than the record posted here. Ram Sharan Nepali has also recorded a few cassettes for the Music Nepal label. If you have any further information on Madan Pariyar and/or Ram Sharan Nepali, please contact me or leave a comment. Catalog number E S R 154 on Shree Ratna Recording Corporation of Kathmandu, Nepal. Manufactured by Victor Musical Industries, Inc. of Tokyo, Japan. Released 1979.